Boldly go where noone has gone before, to the Globe’s first Star Trek Quiz! Calling all Trekkies and Trekkers, we’ve put together a general knowledge quiz relating to all Star Trek TV series as well as films. You don’t need a degree from Starfleet Academy to attend. 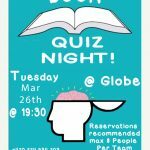 Assemble your away team and make a reservation ahead of time as these quizzes can be very popular. We hope to see you there!